The ten weeks described below go from mid September and end the week before Thanksgiving. As you see below, the first week is Sept 16-20 and the tenth week is Nov 18-22. The instructor for these courses will be Steve Bergen and you can contact him at summercore@gmail or 781-953-9699 if you have any questions about the course or if you want to make sure that this will work for you. Once ready to signup, click here to register. Based on enrollment numbers, you will receive your confirmation number within 48 hours. The cost for any ten week course is $333 but you should not send in your check until you receive your confirmation number. Once confirmed, the address is Summercore, 300 E 85th #3303, New York NY 10028. Checks should be marked payable to Summercore and should be sent within one week after you get your confirmation number. By design each course is a hybrid between a high quality lecture course and having a personal tutor/trainer -- in fact instead of being a MOOC ("massive open online course") each Summercore online course should be called a SOOC ("small online organized course"). Good teaching generally involves relationships something sadly missing from most MOOCs. 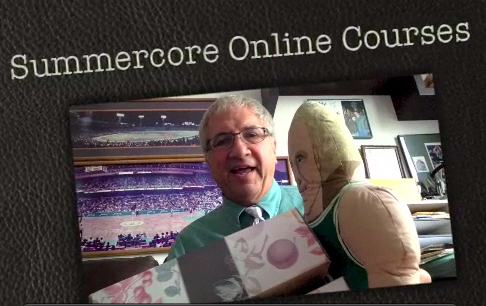 Yes, we finally have figured out a way to offer our popular Summercore curriculum into a 10 week online course! Online Course #1 is based on our 5 day Summercore workshop which has trained over 3,500 teachers and administrators since 1985. This course will help create a foundation of computer know-how, know-why and know-why-not for teachers who are not yet comfortable with the specifics and techniques of using technology in the classroom. Whether you a computer skeptic, a luddite, or just a beginner who has never participated in a quality computer training program, this course will help provide you with skills and classroom techniques to help you move forward. Participants must commit to two hours of work per week for online assignments. Participants need access to any type of computer (Mac, PC or iPad) with internet connectivity of course. Participants must be willing to set aside time for a weekly phone call or SKYPE session. The goal is for each teacher to be engaged in a significant, meaningful usage of integrating technology into her or his own classroom in the second half of this course (last 5 weeks). This ten week course focuses on iPad skills and educational apps to help beginners gain confidence in learning to use this new tool in the classroom. Participants must have access to an iPad and must commit to two hours of work per week. Participants must be willing to set aside time for a weekly phone call or SKYPE session. By the end of the ten weeks, participants will be incredibly skillful with the iPad but more importantly with strategies for using the iPad effectively in her or his K-12 classroom. In the second half (last 5 weeks) of the course, the goal is for each teacher to be engaged in a significant, meaningful usage of integrating iPads into her or his own classroom. This ten week course will help lower school teachers learn to program using HOPSCOTCH on the iPad or SCRATCH on a laptop/desktop so that they can comfortably guide children in learning to code. From loops to variables, we will start from the beginning and work together to gain skills with all the basics of these similar computer languages. Each programming concept will be taught thoroughly, step-by-step, with many examples to help connect programming to the lower school curriculum. Please note that this course is not for experienced programmers or teachers who have achieved proficiency. This course is for beginners who want to learn to program. In the last half of the course (second five weeks), each teacher will be able to integrate into the classroom.